I guess I was just enjoying them too much. They are everything I want in a portion and incorporate my ideal that every snus should be. They are strong, dark, licorice and delicious! Stormy is the word I use to describe them to people. It’s like having a tornado in your mouth, with different elements and just when you think you can’t handle one characteristic, another one comes and knocks you out! Ok back to reality; let’s talk about…the can! 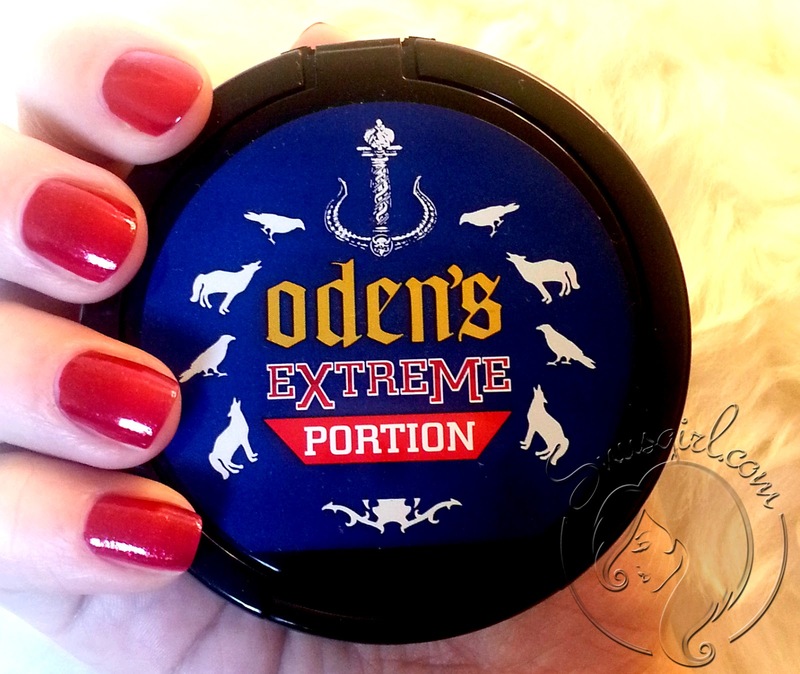 Classic Oden’s can in black, navy blue label embellished with bright red and gold, and don’t forget the classic Oden’s scavenger animals (wolves and crows) printed on the top of the lid, ready to pick my bones clean when I finally succumb to my tobacco addiction. Haha I’m kidding of course, I've never felt better in my life then when I started using snus! The smell is very candy like and not that of true licorice root. Which is fine for me right now, im on a very low carb diet in preparation for a very special cruise in a few days, so candy is definitely off the menu and if I can have snus to stop my sweet AND nicotine cravings then it’s a win win! The portions are regular and strong so they do have a little bit of a drip, but not as bad as thunder. I sometimes have the habit of spitting my portions into a tissue when used up and its always interesting to see how well the strong portions can turn the whole thing brown with tobacco juice, yet surprisingly it never stains my teeth and i always use a whitening toothpaste so that helps as well. Me being as vein as i am, if i experienced any negative appearance from snus i would be the first one to stop it immediately, but so far so good! 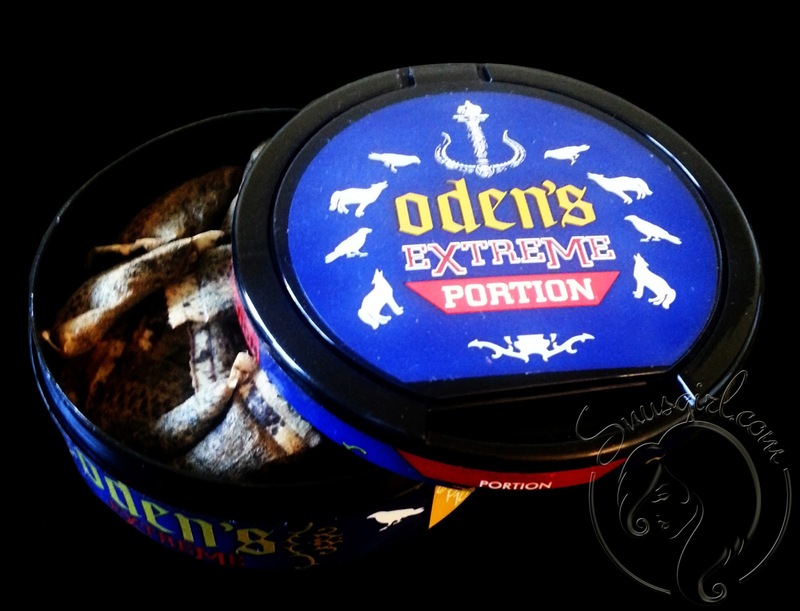 My only complaint about Odens is that i wish the can contained more portions (its only 18 mg's). It always seems to go so quickly. It does make sense considering its cheaper then the Swedish match products (that contain 24mg's), but i myself would not mind paying more per can if it could last a little longer. 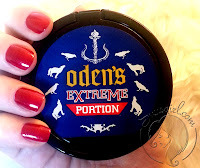 1 comment on "Oden's Extreme Licorice Portion Review"